Are you concerned that your Investment Portfolio might have holes in it? U.S. equity markets can be a rough ride, but alternative investments can help calm the seas and increase portfolio performance. According to the Hufﬁngton Post, investor's allocation to alternatives investments will grow 10% per year for the next ﬁve years, reaching $13 trillion in volume by 2020. For most investors, it’s not a question of if you should be leveraging alternative investments, but rather which alternative investment asset type(s) will work best for your particular situation and long-term investment objectives. Still not certain whether alternative investments are right for you - or even what types of investments are considered “alternative”? 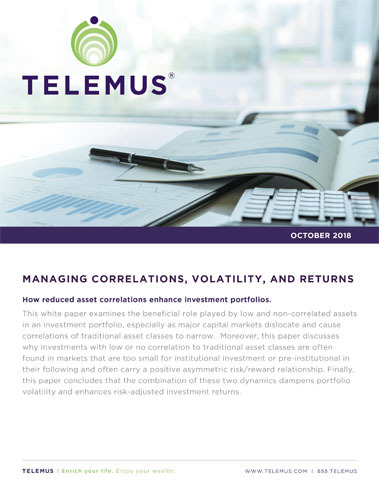 Download our white paper on Alternative investments where we share our experience and research on managing correlations, volatility and returns.